A tilemap is essentially an grid of cells where the value in the cell indicates what should be at that location. So we we might define “1” as grass and “2” as mud and define a map using these values describing an area in the game. The first nice thing about tilemaps is they’re simple. Its very easy to implement a tilemap using a standard two dimensional array. You simply fill it full of values and access them using x/y coordinates. The last nice thing (that I can think of) about tilemaps is that they’re quick to access. Given a particular location on the map it can be very fast to get to the properties associated with that area. Normally its simply a matter of accessing into an array based on the x/y location of an entity. 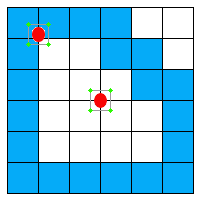 The diagram above shows a simply tile map with a couple of entities (red blobs). The blue cells represent blocked areas and the white cells clear ones. Around the entity we have a simple box collision bounds. The green points mark locations that we’ll check for collision. So, the entity in the top left is in an invalid location (its partly into the wall). The entity is the middle is valid. Now, how many points you check and where the points are specific to the application – and obviously this isn’t perfect collision for everything. However, when entities are simply moving round a map at slow speeds even this 4 point checking can work fine (as we’ll see in the tutorial code). Note that with this simple corner checking system the entity bounding box needs to be smaller than the cells of the grid. This is better in some cases because instead of checking reasonably complicated bounds checks on bunch of cells, we check explicitly the ones we want to in a very quick tile map based way. The tutorial code is built up of 3 classes. Lets just go over what they’re for. Doesn’t do much does it? The actual work is being performed in validLocation(). This method simply works out where the entity will be if the move is performed. It checks if this is a valid location (which performs the collision checks). If it is a valid location it moves the player, if not it doesn’t. This way you can’t move the player into walls. Again, this is pretty simple right? We go away to the map and check the four points around our player that represent its collision box based on the “size” associated with this entity. If any of the points are blocked then this isn’t a valid location – otherwise it is. Really simple and really quick! We take the floating point values passed in (which are in grid cells) – cast them down to ints which instantly gives us the grid cell we need to check. Check the cell and return yes or no. Tilemaps make sense for certain situations. In most cases they’re based combined with other techniques. For instance, it might make sense to use the tilemap to work out which cells need to be checked and then using bounds checking to work out the actual collision. Tilemaps don’t fit in every game but in many cases they are a powerful tool for both rendering and collision detection. Implement Sliding – If you’ve tried the tutorial example you’ll find that you don’t slide along walls like you do in so many games. This is pretty easy to implement by just apply the x and y axis movement separately.